How to Identify a Mud Wasp Nest? Some species of wasp make nests out of the mud. These are commonly referred to as mud daubers and are generally not aggressive unless provoked or handled. Common species include the blue mud dauber, the organ pipe mud dauber and the black and yellow mud dauber. Mud daubers are not social wasps and are in fact solitary. This means that they do not live in a colony and create the mud nests to store their eggs. They prefer to build their nests in hidden and undisturbed places such as porch ceiling, under eaves, in barns and sheds, attics and on exterior walls. The appearance of the nest may depend on the specific species of mad dauber that built it. Call your local wasp removal services if you need help dealing with wasps. 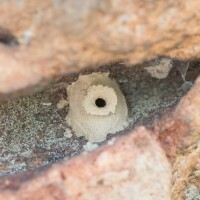 The obvious identifying feature or a mud dauber nest is it is made from mud. Other species of wasp make their nests from chewed wood. The organ pipe mud wasp, true to its name, creates parallel cylindrical mud structures, or tubes, side by side. The result looks a lot like organ pipes. Each cylinder may be divided into cells and a single tube can measure up to 8 inches long. Black and yellow mud dauber nests are globular, much like ‘regular’ wasp nests in structure. The nest may also contain several cells. These wasps take anywhere from a few hours to three days to complete the nest. The female is responsible for building the nest. The wasp collects clay soil with her mandibles and rolls into a small ball before carrying the mud between her front legs to the construction site. The insect can make up to 40 trips to complete the nest depending on its size. The wasp uses saliva to smooth the mud into shape. Depending on the number of eggs, the wasp may create multiple sealed chambers in each tube in the case of the organ pipe or multiple sealed chambers in a globular nest. The chamber is known as a brood cell and is where the wasp lays her eggs. Prior to this, the wasp will inject a spider with a paralytic agent and carry it to the brooding cell. A single cell can contain up to 9 paralyzed spiders. The wasp finally lays eggs in each cell and seals with mud. Once the eggs hatch, they feed on the spider which will still be alive by this time. The male wasp may remain in the nest during construction and leave only when the nest is sealed presumably to protect it from predators and parasites. The wasp will finally burrow its way out of the nest once it reaches adulthood, usually in early spring. Blue mud daubers are notorious for repurposing old empty mud nests rather than building from scratch. It is also not uncommon for these wasps to invade active nests, remove existing eggs and spiders and insert its own eggs and prey before sealing and moving on. Mud dauber wasps typically don’t defend their nests and attacks on humans are rare. Still, it is prudent to wear protective gear when attempting to remove any wasp nest. The gear includes protective clothes, gloves, face masks and goggles. Removing any kind of wasp nest is a delicate process especially if you are allergic to stings. 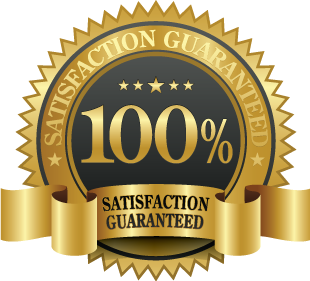 Hire a professional wasp removal service in Toronto to take care of the wasp problem permanently and safely. An expert can also make the recommendation on whether removing the nest is at all necessary depending on its location. Mud dauber wasps help with pollination and prey on common nuisance insects and arachnids such as spiders.